Up until this summer if you wanted to play a true links course you had to fly across the Atlantic to The British Isles or west to Oregon’s Bandon Dunes. Now we have our true links course in Canada in the town of Inverness on land that was formerly a coalmine. How fitting it is that the game that was born in Scotland has now traversed the ocean and taken root in Inverness, first settled by Highland Scots in the 1800s and still a place with strong Celtic traditions. What is a true links course? There seems to be no definitive definition. This is the original type of golf course design, dating to the origins of the game, found in such courses as St. Andrews and Turnberry. Scotland, Wales, England and Ireland boast most of the planet’s links. Traditionally they were built on inarable sandy oceanfront land exposed to the salt and wind. Some links have minimal views of the sea and are as flat as pancakes; others run alongside the ocean with towering dunes. The vast majority of courses calling themselves links are not; authentic links constitute less than one percent of all courses on earth, yet this small collection includes nearly half of the best courses in existence. Whatever your definition of links golf, there is no doubt that Cabot Links is the “real McCoy.” It occupies a sandy coastal site that drains exceptionally well, resulting in firm, fast fairways. Trees are few and far between allowing it to be scoured by wind. There are plenty of deep pot bunkers, and in almost all cases, approaches to greens are unobstructed, promoting bump-and-run shots. Greens are firm and hard to hold with lofted shots. The back nine has a dune-like landscape. Looking out onto the course with the blue Northumberland Straits and round Margaree Island beyond and golden fescue rustling in the breeze you’d swear you were in Scotland. Think Turnberry and Ailsa Craig on the Ayrshire Coast. The par-70, 6,803-yard course, designed by Albertan Rod Whitman, offers views of the sea from every hole. Joe Robinson, Golf Director at Cabot Links organized for Shane and Liam, a couple of locals who teach in the winter and caddy in the summer, to accompany us on our round. 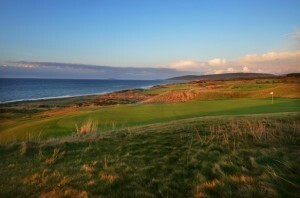 In keeping with true links traditions, Cabot Links is planted from tees-to-greens with 100 percent fescue. Drop your first putt and you’ll be rewarded with the sound of it clinking into a tin cup. You don’t have to hire a caddy but I highly recommend it. Ours gave us lots of valuable tips, especially on the cleverly contoured greens. Unless you have a medical condition, you do have to walk the course. And what a joy that is, especially around numbers ten and eleven that play around MacIsaac’s Pond where lobster and crab boats bob in the harbour. Numbers 12 to 16 play right along the beach. With luck you’ll spot dolphins or whales while you practice your bumps and runs, plus every other shot in the book. Number 14 will likely be the signature hole. A nod to the famed seventh at Pebble Beach, it’s a short 90-yard, par-three with a downhill pitch to a peninsula green jutting into the water. The folks who own Cabot Links (Ben Cowan-Dewar and Mike Keiser of the highly ranked Bandon Dunes) fully intend to make this former coal-mining outback a world-class golf destination. In fact, Bill Coore of the renowned design team Coore & Crenshaw (architects of the newly renovated Pinehurst Number 2 and Bandon Trails among other greats) has already visited Inverness to route the next 18. Dining at the resort’s Panorama Restaurant with floor-to-ceiling glass walls overlooking the 18th hole is especially memorable as the sun sets into the Gulf of St. Lawrence and the last of the golfers are sinking their putts. Chefs John Haines and Tracy Wallace, a husband and wife team, make everything from scratch using the freshest seafood, local meat and organic produce from a nearby spring fed gardens. Their seafood chowder, brimming with lobster, scallops, shrimp, bacon, potatoes and leeks has won several awards. Another winner is the smoked pork chop marinated in apple cider and Dijon mustard, grilled and topped with Wallace’s grandmother’s recipe for apple purée. You must also try the lobster ravioli. Cabot Links recently won a Wine Spectator Award for its comprehensive list of vintages from around the world. There’s also an ample selection of single malts from the Highlands, Islay, Orkney and the Glenora Distillery just ten minutes away. Glenora, opened in 1990, calls its “water of life” Canada Single Malt because only whisky distilled in Scotland can be called Scotch. Now this area of Cape Breton not only boasts Canada’s only true links course, but also North America’s first single malt whisky distillery. They too have a very good dining room and a lively pub where you can sample drams from their various vintages and enjoy fiddle music most nights. True to its Scottish roots, you’re never far from some lively jigs, step or square dancing or a Ceilidh (Celtic for gathering which translates to kitchen party). Le Portage claims to serve the best homemade food on the island in its hilltop clubhouse. Indeed, fresh crab and lobster sandwiches on whole wheat bread from the local Aucoin’s Bakery washed down with an Alexander Keith’s beer hits the spot. It was just six o’clock when we joined a steady stream of cars rolling down the lane toward the Barn at the Normaway Inn (thenormawayinn.com; 1-800-565-9463), owned by Dave and Theresa Macdonald. The Margaree Valley locals know you have to arrive early to get a seat at Dave’s Wednesday night ceilidh. “Dave was Celtic long before Celtic was cool,” chuckles Theresa. Such local talent as Ashley MacIssac and Rita MacNeil have filled Dave’s barn. After the fiddling and folk songs comes the dancing. It was well past midnight when we finally left the floor and the joint was still jumping. En route to Highlands Links, we stopped off at some of Chéticamp’s craft shops. At the Sunset Folk Art Centre I met wood folk-art artist, William Roach, who carves whimsical pieces such as a purple moose wearing yellow rubber boots or a surfing puffin sporting a Canadian flag on its helmet. Next door at the Frog Pond Café we bought coffee and fresh pastries made by some local Buddhist monks and sat on a patio where a local gent strummed the harp. In Pleasant Bay we took a two-hour whale-watching excursion with Captain Mark (www.whaleandsealcruise.com; 1-888-754-5112) on his 42-foot Double Hookup research vessel. We hit the jackpot. Squadrons of Pilot whales swam within feet of the ship. Captain Mark turned on the sonar so we could hear their cries underwater. 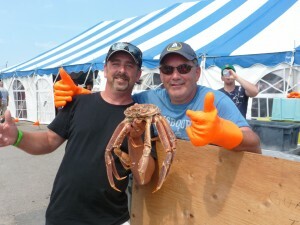 Some locals recommended that we stop at picturesque Neil’s Harbour for our daily fix of shellfish at The Chowder House. They make a mean lobster club. If you grew up in this countryside you’d be forever homesick for it, I mused as we entered Cape Breton Highlands National Park and followed the Cabot Trail—nature’s masterpiece of windswept coastlines, rugged highlands, steep canyons and craggy cliffs. We were en route to Highlands Links (rated number one in Canada in 2006 by SCORE Golf Magazine and one of the world’s top 100). No golfer within driving range of Highlands should miss this national treasure, albeit not a true links. Perched high on a cliff at Ingonish is the red-roofed Keltic Lodge, where the doorman, jauntily attired in a tartan kilt, pointed out that we were “just a five-iron” from the Highlands Links club house. The late Scotsman Stanley Thompson (also the architect of the Banff Springs and Jasper courses), claimed that God designed Highlands and that he merely discovered it. Each memorable hole on Thompson’s so-called “mountains and ocean” course bears a Scottish name. Heich O’Fash (Heap of Trouble) aptly describes the fourth and Tattie Bogle (Potato Pit) sums up the bumpy terrain on number 15. Highlands is ingeniously routed from rocky headlands to secluded wooded glens with stunning mountain and sea views, brilliant bunkering and rarely a flat lie. Number 16, Sair Fecht (Hard Work) is an uphill battle on a fairway full of baby moguls. Drive your cart up this one and you get a free cellulite treatment. The late George Knudson used to stroll the fairways without his clubs just to savour the scenery. Highlands Links was the first Audubon Certified Course in Atlantic Canada, so don’t be surprised if you spot a bald eagle overhead or a fox takes off with your ball. Over the last few years the maintenance folks at Parks Canada have restored many of Stanley Thompson’s original design features including rebuilding most of the bunkers. 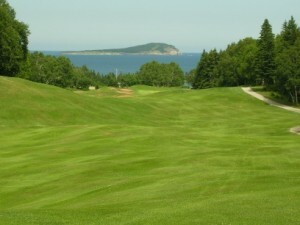 They have also cleared a lot of trees, thus allowing greater vistas of Ingonish Bay from several fairways. Next stop, Baddeck and the Bell Bay Golf Club (selected as the “Best New Course in Canada” by Golf Digest in1998), named after the village’s most famous resident, Alexander Graham Bell. Both high and low handicappers love the generous fairways and meticulous manicuring at Bell Bay, exactly what Canadian architect Thomas McBroom intended. Just down the hill, at the Alexander Graham Bell National Historic Site we learned more about the man and his amazing inventions that include the telephone, man-carrying kites, a hydrofoil boat and his experimental airplane, the Silver Dart. Being a true Scotsman, Bell built a par-four and two greens on his estate named Beinn Bhreagh. Later, we followed our noses to Baddeck Lobster Suppers, where maple planked salmon was sizzling over an apple wood fire. Shirl took the salmon; I ordered a gigantic lobster and all-you-can-eat seafood chowder, mussels, rolls, salads and desserts. Some local experts at the next table gave me a crustacean-cracking lesson and invited us to the nightly summer ceilidh at St. Michael’s Parish Hall (www.baddeckgathering.com; 902-295-0971). The snug room, hung with quilts was packed. Two local musicians, a fiddler and a piano player, regaled us with toe-tappin’ tunes and local lore. We also got a square dancing lesson from manager Nancy MacLean before the break when we sampled oatcakes and a strong cup of King Cole tea, the preferred brew of Cape Bretoners. Last but certainly not least, we hit Cape Breton’s newest course, The Lakes Golf Club at Ben Eoin (pronounced yawn). Opened in 2010 and designed by Graham Cooke, this 6,970, par-72 beauty confirms my opinion that there are no cookie cutter courses on Cape Breton. Each one has its own unique character and style. 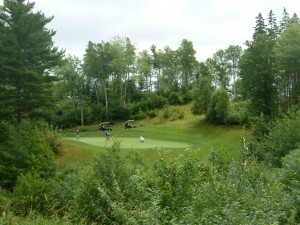 Slopes and elevations changes take golfers on a merry romp over several brooks and several plateaus. 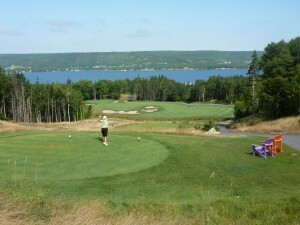 From the hugely elevated tees on number six, you’ll have marvelous views of the sailboats on the Bras D’Or Lakes below. The staff has dotted the tees with colourful Muskoka (or should I say Cape Breton?) chairs in case you want to pause awhile and soak up the vistas. We stayed next door at The Birches and dined in their Malcolm’s Dining Room where baby-faced young local chef, Ron MacNeil, dazzled us with such creations as lobster sous vide with vanilla-infused mashed potatoes, a velvety saffron lobster bisque and coconut/lime cheesecake. In Cape Breton Shirl and I discovered the ideal recipe for a serendipitous golf vacation: play a new course every day and don’t keep score, consume lobster at least once a day, take in a local ceilidh session every evening and hit the sack with happy tunes dancing around in your head. 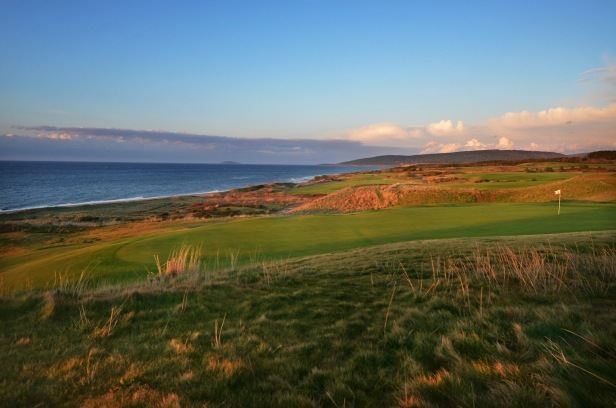 The Cape Breton Golf Trail, now with Cabot Links, is without a doubt a must-play golf destination. For duffers or folks with families who want a cheap and cheerful round, consider the nine-hole Baddeck Forks where the maximum greens fee is $25. Darren and Loretta Baker, who had been living in Alberta, bought the course in 2010. “I saw it as a chance to come home,” says Darren who does all the maintenance work while his wife cooks up delicious grub in the new clubhouse. You might join them for a fun round of night golf using glow balls accompanied by their neighbour, Mr. Johnston, blowing the bagpipes. And when Cabot Links’ sister course, Cabot Cliffs, is complete they’ll be yet another great excuse to hit the Cape Breton Golf Trail. We flew Air Canada to Halifax, rented a car and drove approximately four hours to Cabot Links. From there we made a clockwise loop around Cape Breton, ending in Sydney, from where we flew back to Toronto. Just a five iron away from Highlands Links, Keltic Lodge Resort and Spa is perched high about Ingonish Beach. Bring your kilt and dancing shoes and partake in the nightly entertainment in the Highlands Sitting Room after a marvelous meal in the Purple Thistle Dining Room. 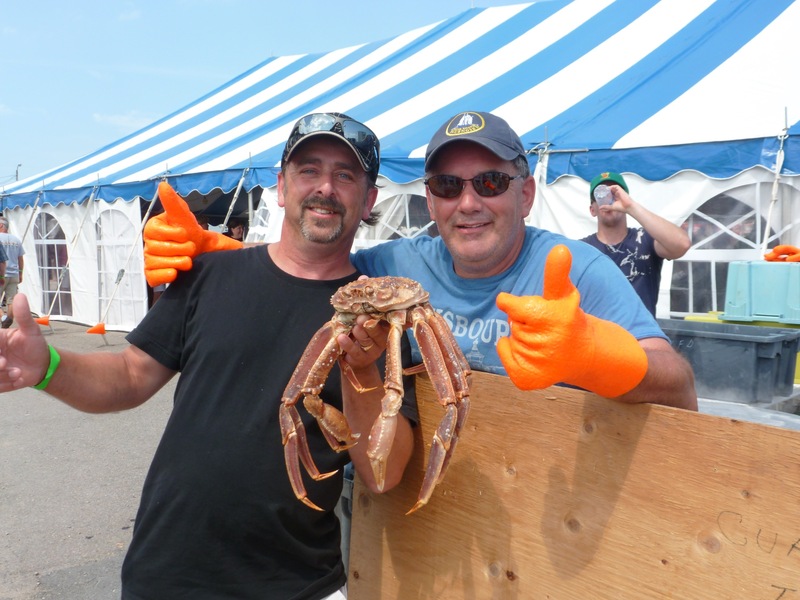 The seafood chowder gets my vote as best in Cape Breton. Maison Fiset on Chéticamp’s main drag is a luxury B&B. Each spacious room or suite has its own patio. Breakfast is made-to-order. Manager Lynn Larade will make dinner reservations and even organize a shuttle to transport you. The Inverary Resort in the centre of Baddeck is minutes from Bell Bay. The Birches at Ben Eoin (pronounced “yawn”), a 12-room country inn is next door to The Lakes and about 20 minutes from Sydney. Each room has fireplace and balcony overlooking the Bras D’Or Lakes. Malcolm’s Dining Room serves memorable dinners.